The dysfunction of Sammamish City Council reached new levels over a proclamation in support of Senate Bill 5323 that calls for a state-wide plastic bag ban and a 5 cents tax for paper bags. The plastic bag ban has come before the previous city council on March 7, 2017. Several citizens voiced a different position on the bans, including the Sammamish Chamber of Commerce that supported the ban but opposed a tax on paper bags. Then-Mayor Don Gerend directed the City Manager to schedule a study session and encouraged both pro and con groups to provide the city scientific evidence. The study session has not been scheduled and it has been sitting on the council’s long term calendar since. Council Member Jason Ritchie is a supporter of the plastic bag ban and of SB 5323. His Facebook page shows several instances of paid posts supporting banning plastic bags. In December, Ritchie announced his plans to introduce a Sammamish plastic bag ban ordinance. During the March 20 legislative committee meeting, Ritchie proposed that the full council discuss a proclamation in support of SB 5323. Council rules specify that adding an item to the preliminary agenda can be done by the support of three council members–which Ritchie did not have. Nevertheless, the draft proclamation ended up on the April 2 council meeting’s agenda – not as a formal agenda bill but as an item related to Council Member Ramiro Valderrama’s report on the legislative committee meeting, circumventing council rules. When the meeting got to the Draft Proclamation on SB 5323, Council Member Tom Hornish moved to table (postpone) any discussion to a later time. The council voted 4-3 in favor. Hornish’s motion was premature given that the Draft Proclamation was not a formal agenda item and Ritchie has not yet moved to propose it. The council erupted in a long discussion on proper procedure, including the real-time reading of council rules, consulting with the City Attorney and City Manager about the proper procedure, and on a new motion by Ritchie to consider his proclamation as part of the agenda. The new motion appeared that it could have remedied the procedure breakdown. However, Ritchie withdrew it before the council had a chance to vote on it. Ritchie then moved to have the proclamation be discussed in a study session but no one seconded. “After that meeting it has been stated that 4 members attempted to stifle discussion, but that is not accurate as the topic was tabled (which means it will be discussed later) and it was tabled due to what most of us viewed as procedural error. Again, the 𝒎𝒐𝒕𝒊𝒐𝒏 𝒕𝒐 𝒅𝒊𝒔𝒄𝒖𝒔𝒔 𝒘𝒂𝒔 𝒘𝒊𝒕𝒉𝒅𝒓𝒂𝒘𝒏 by the Councilmember that made it, so there wasn’t the opportunity to debate any subject matter. When reached for comments, Ritchie pointed a finger at Ross, saying that “during our last meeting, espoused virulent and personally offensive views of myself and CM Stuart. He crossed a line and we are owed a personal apology”. The Comment obtained the audio recording of the March 20 Legislative Committee meeting, attended by Valderrama, Pam Stuart, and Ritchie. The recording reveals that indeed Ritchie sought support from the entire council to add his proclamation to the formal agenda – but didn’t receive such support, with the exception of Stuart. Valderrama warned the others that the issue is controversial and reminded the committee of past discussions, where Sammamish citizens, some who claim to be experts on the subject, offered different opinions. One of those citizens is Todd Myers, who is the Environmental Director of the Washington Policy Center. Myers opposes the plastic bag ban. Ritchie also insisted that the vote on the proclamation moves forward immediately before a study session – even though it was clear it has no chance to pass. In the end, the three voted unanimously to recommend a study session on the subject and voted 2-1 to bring a draft proclamation to the council, with Valderrama dissenting. In response to the Comment’s question on why insisting on bringing to a vote an issue that clearly didn’t have the support of even three council members, Ritchie told the Comment that he believed Malchow would be supportive of the plastic bag ban, to the extent that she placed the issue on the long term agenda’s “parking lot”. Further reading: the full text of Ritchie’s comments to this article. There is no reason to duck an issue. Your opinion should be a matter of record, for or against, I may not agree with you on a particular issue, but I have respect for your opinion. Great piece, thanks for doing the legwork here. Those text messages are eye openers for sure. I watched this council meeting live. It was a complete disaster. This is clearly a divisive issue – personally I am against the bag ban but I am sure others are in favor. But why even bring this up when the council could be discussing more important items that they have broad agreement on? Why hasn’t there been a study session on the ransomware attack? Why hasn’t there been any discussion on getting EFR service restored at station 81? What is the situation vis a vis the budget? How close are we to running out of money and needing to raise taxes? These are three issues that are unquestionably more important than any proclamation about any topic. They are being completely ignored by the council. Instead, they bring up useless political nonsense and try to needle each other. 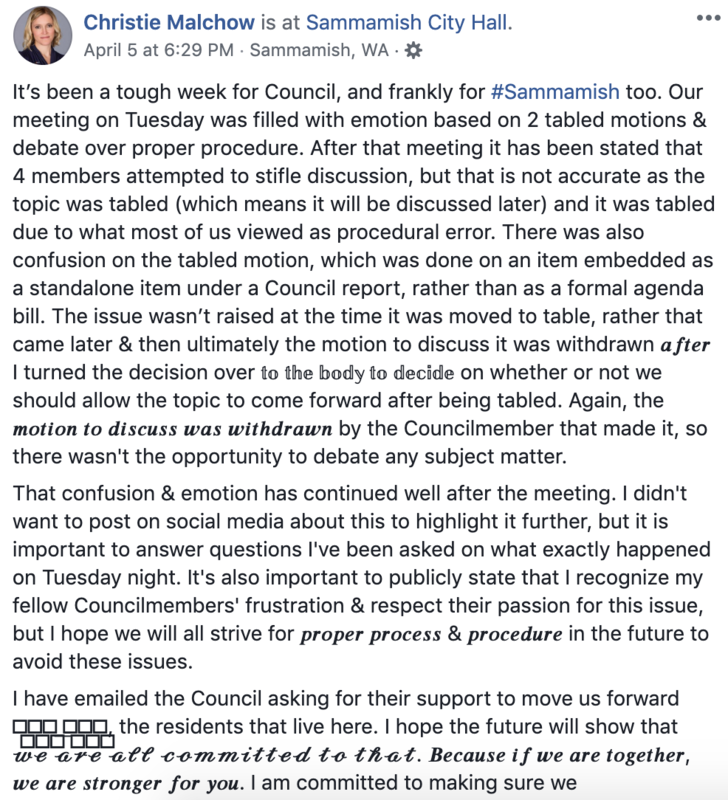 My question to every Sammamish councilmember: why are you putting personal vendettas against the other side above the duty you have to serve the people? Why is every council meeting dominated by childish bickering? Does Sammamish have provisions in its code for recall elections? Thank you for redirecting toward a few of the actual, critical issues that need attention and require updates for the public. 2) The studies on plastic bags are from the U.K. and Danish governments (among others). I’m not sure how their research is partisan or why it would be dismissed unless they are politically inconvenient to the councilman. What’s clear is that Ritchie does not take defeat or being challenged well, going so far as to denigrate and attempt to bully constituents and his electorate. What is not clear is how he got elected in the first place. He may need help before he hurts someone. Ritchie should go back to school to get an education. The guy is a joke. He’s totally unfit for any public office, but that only makes him a member of a very big club. Todd is right the ban is bad for the environment. We should not adopt it. How could he say “grow a pair”? That’s so sexist. That speaks volumes in how he feels about a female mayor who doesn’t have “a pair.” This is just awful! Where’s the public outcry in how genitalia is being referenced in Richie’s sexist, mysogenistic text. You should know the context of these remarks is being ignored. CM Ross made a series sexist and racist remarks to me in an open meeting and afterward in another meeting. I had heard enough. I demanded he apologize, he refused. I demanded he stop, he refused. I will not sit by when this happens. I will confront it. The comments he made about CM Stuart, myself and minorities in our community were completely inappropriate. Even if Ross made the statements Ritchie alleges, which knowing Ross, I doubt, this does not excuse Ritchie’s obscene and overt racial remarks in his texts. Ritchie would be better off taking the high ground—but he didn’t now and he doesn’t as a matter of personality. The text messages from Ritchie to Ross expose in vivid detail the mean-spirited personality he hides behind an affable exterior. This is something I’ve seen for more than a year, having read emails and other communiques from Jason. If you read his full responses to Sammamish Comment’s questions, you will see that Ritchie only casts blame toward others and accepts no responsibility for his own actions. He doubles down on everything and sees nothing wrong with his obscene and insulting texts to Chris Ross. When I was editor of The Comment and first interviewed Ritchie in Feb 2017, it was clear he was uninformed and naïve about the political realities of the Growth Management Act and the State Legislature. This was surprising given the fact he had just run for the State Legislature (narrowly losing to Jay Rodne), and before that, for US Congress, a race he also lost. He should have had a good grasp of the issues. He did not. In the only candidates forum for his position, Ritchie fell back not on well researched positions, but empty, feel-good platitudes. During his first year on the council, Ritchie was amazingly incurious. He proved to be a light weight empty suit with a hidden mean spirit. His second year has been marked by invective with his fellow council members such as demonstrated by his text messages. The dysfunction of the council is due in no small part to Ritchie’s actions (though in fairness, he’s hardly alone). In the meantime, the peoples’ business suffers. It is interesting that Jason claims to defend women and minorities, but he can’t seem to get along with the women and minorities on the council. We’re waiting for you non-apology, Jason. You know, the classic politician’s “I’m sorry if my remarks offended anybody.” Apparently your testosterone level precludes even that. What a hypocritical extremist response. YOU did wrong and your response is to cry “sexism” and “racism”. Taking cues from the extremist identitarian left to spin your shame is inexcusable. A non-apology would have been expected, but your “attack apology” is a complete embarrassment. Ritchie, your ridiculous attitude shows what a complete fool you really are. You will NEVER get my vote. Jason, I am shocked and offended to the core on your fabricated statements above. Further, I have never been asked to apologize for anything and recall all of our meetings as amicable. I want to move on and focus on working together in our council roles. The slander and untruths above however have to stop. Let’s focus on the people’s business and it is ok if we disagree.